We’d booked one of the Hearst Castle evening tours last year but were foiled by a medical emergency. 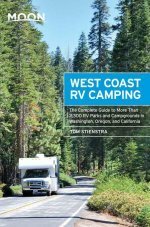 We were determined to do one on this year’s drive down the Pacific Coast Highway, though, so we booked again. Thank goodness we did, as touring William Randolph’s former home along California’s Central Coast as the sun is going down is the most magical way of seeing Hearst Castle. We’ve done a daytime tour before, and the two are very different. There’s a slight overlap in that everyone is always given an overview of Hearst Castle, of course, but there’s a special feeling as you ride up to the castle in the coach while the sun is sinking in the sky. As you approach you can see the castle light’s twinkling in the twilight, and hear the perky sounds of some Jazz Age music around the grounds. 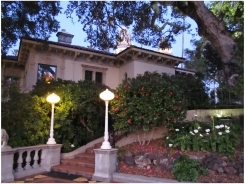 For the evening tour they try to recreate the atmosphere of one of William Randolph Hearst’s famous parties, for which movie stars and politicians would arrive from Los Angeles, over 200 miles to the south. Guests would get here by taking a train from Burbank, getting into Hearst’s own special carriages at the back of the train. They would get out at San Luis Obispo, where a limousine would pick them up and bring them to the castle. They would be given a tour of the castle and grounds, and meanwhile maids would unpack their bags so their rooms were ready by the time the tour finished. It’s very similar to today’s tours – except you don’t get to stay in the castle overnight! As you’re guided round the castle you encounter actors in costume, who really help create the feeling that you’re also a guest at a Hearst party. An entertainer sings by the spectacular outdoor pool, a group of guests is playing billiards in the billiard room, some are doing jigsaws, others chatting on the phone, and some women seem to be have a wonderful time swapping gossip in one of the guest bedrooms. A Hearst party would normally begin with cocktails, followed by a 5-course dinner. Guests were told not to bring their own alcohol, as Hearst believed in moderation and he would provide the drinks for his guests. After dinner there would be billiards and other games, perhaps a movie in the private cinema, or entertainment around the swimming pool. We visit one of the medium-sized guesthouses, the Casa del Monte, where Cary Grant and David Niven had both stayed. It got its name because Hearst liked to tell guests that they looked out at his mountain. Yes, his mountain. You can see one peak 35 miles in the distance which marked the edge of his property. Other notable guests over the years included Charlie Chaplin, Winston Churchill, George Bernard Shaw, Howard Hughes, Gary Cooper, Joan Crawford, Harpo Marx, Jean Harlow, and many more famous names. 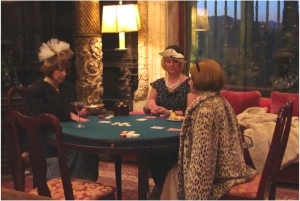 Single female guests stayed in the main houses while single men stayed in the guesthouses. Unmarried couples were not allowed to share a room. As well as the party atmosphere, the tours do also tell you all about the building of Hearst Castle, where Hearst’s money came from (and where it went), with a few juicy bits of movie star gossip along the way. You visit some of the overwhelmingly opulent rooms like the Guest Library, the Main Library, the Dining Room, the Morning Room, the Kitchen, and even into Hearst’s private suite. It’s an entertaining evening, an eye-opener into the private world of William Randolph Hearst. As we were driving back to the Visitor Center in the bus, fellow guests were all talking enthusiastically about the tour. One even said: ‘That was worth driving all the way from San Diego for.’ High praise indeed. The entrance to Hearst Castle is in the little town of San Simeon, right on the Pacific Coast Highway. It’s well sign-posted on your right if you drive north about 9 miles from Cambria (allow 15 minutes). Drive into the large parking area and then go into the Visitor Center to collect your pre-booked tickets. Coaches up to Hearst Castle leave from the Visitor Center at the specified times. You might want to try to get there at least an hour before your tour as a fascinating and informative 40-minute film, Hearst Castle: Building the Dream, is shown every 45 minutes throughout the day in the theater. 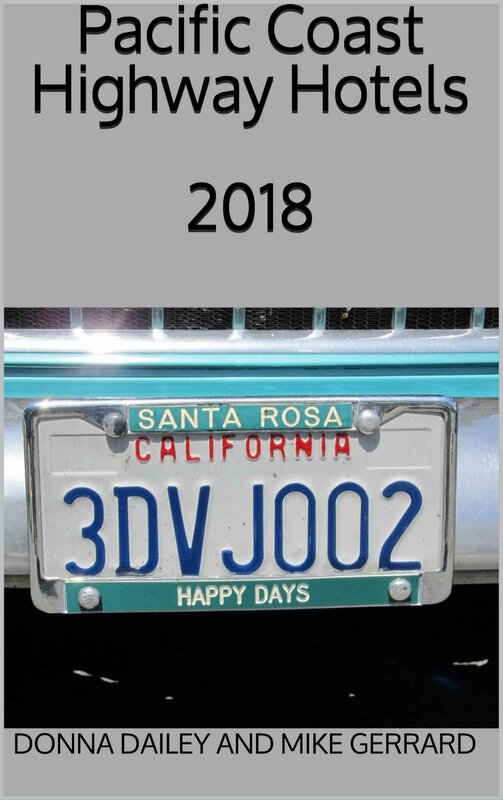 Check the showtimes in advance on the Hearst Castle Theater page of their website. 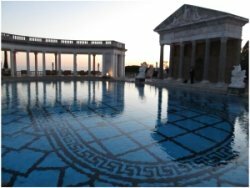 You must book in advance for an evening tour of Hearst Castle, as places are limited and the tours are extremely popular. They also only take place in Spring and Fall, on most Friday and Saturday evenings. Tours last 2hrs 10mins and involve climbing up and down over 300 stairs. 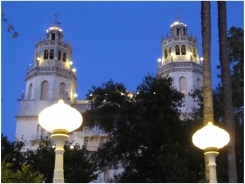 Learn more and book your place on the Hearst Castle Evening Tours page of their website.